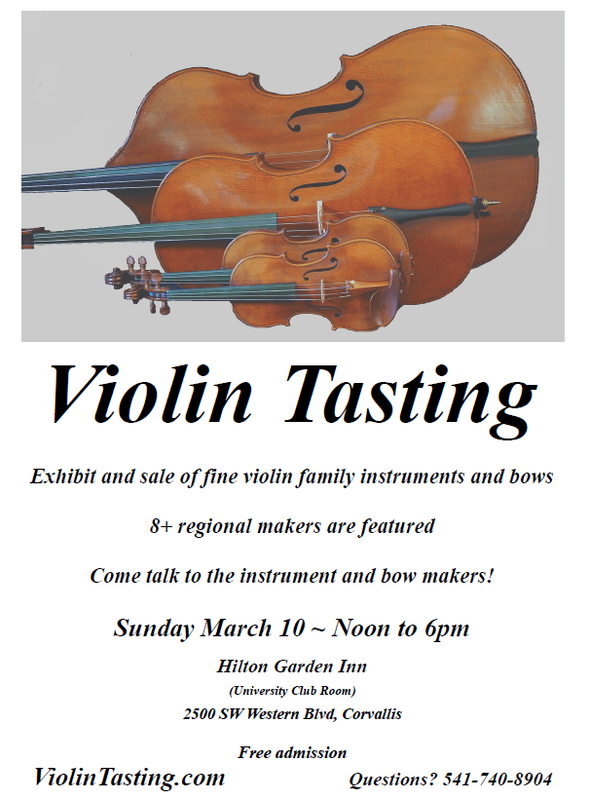 Violin-family Instrument-Makers from around the Pacific Northwest will be there. I will be there, with Violins, Violas, Cello and five-string fiddles. One of the things that was holding me back is that my old home-made bending iron simply wasn’t good enough. So, the first step toward completion is to make a new, hotter, smaller diameter bending iron. The old one was heated with a propane torch, but it was quite large, and it took a long time to get it barely hot enough to function. This one will have an electric element for heat, and much smaller diameter, as well as much less mass. I hope it works well. Another maker shared how he made his bending iron, and I am attempting to emulate his example. If that works, I can get moving and complete the bass this fall. A few years ago, I had salvaged some curly Big Leaf maple from a very large tree that was being removed from my wife’s childhood home. I promised I would build her a cello from the wood, so she would have a treasure from her childhood. So, the wood is fully dry and seasoned, now, having sat out in my shop for several years. It has humidity-cycled through the changing seasons, and should be quite stable, now. A friend (Steve Stevens, now deceased) had given me a cello top set of Red Spruce, so that will go into the mix as well, making it a treasure to both of us. What I hope to do, is to give special attention to getting good pictures of every step of the construction and finishing of this cello, so as to post a running commentary and tutorial as I work. On every project thus far, I have had a tendency to get engrossed in the work and forget all about pictures. So, I may recruit Ann to take the pictures, so that I can keep rolling. I haven’t decided just how large, yet…the largest violas I have made in the past have been 16-1/2″ on the body, which is pretty good sized, and already too big for some folks. But I am considering either a 17″ (or larger) viola, or a “Viola da Spalla”, sometimes called a violoncello da spalla, or a small Violoncello piccolo. The Viola da spalla is played off the right shoulder, so that the chin is over the bass lower bout, but not on a chinrest. A strap holds the instrument up under the player’s chin, and the bowing hand reaches up from beneath, to access the strings. Frequently they are made as a five-string cello, and that is how I would approach it. Tuning, then, is in the same range as a cello, but adding one higher string: C, G, D, A, E.
Either way, I realize I am probably building something I will never be able to sell, as there isn’t much market for either instrument. (Ah, well… some things we do out of love.) Anyway, this one is not a very high priority. I hope to begin at least two of the projects soon, and begin posting photographs. It wasn’t all guitars and fiddles, as you can see. 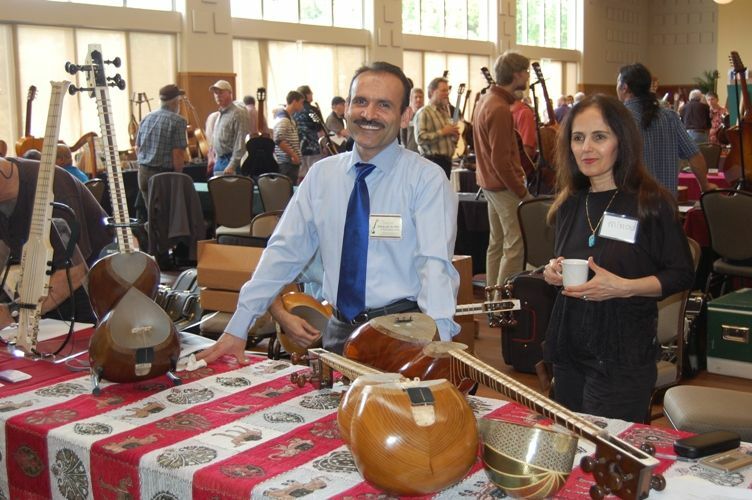 This couple makes Persian instruments called “Tars” (the larger ones) and Setars, (not “Sitars”, which have 30 strings…traditionally, a Setar has three strings, but apparently about a century ago, a tradition of four-string setars began.) That little thing to the right of center is a setar. 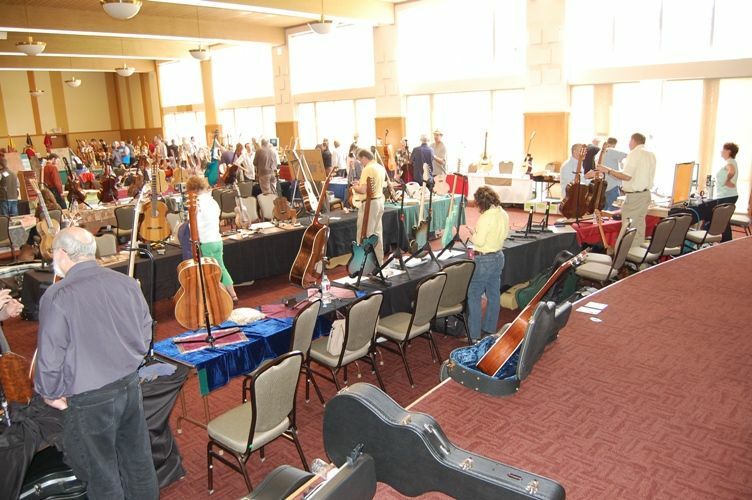 There were also two banjo makers, several ukulele makers, mandolin makers, an orchestral harp maker, and, yes, even a few fiddle makers. And every kind of guitar imaginable. The table in the next photo was mine…I was sharing it with my son, who makes guitars. That worked out well. We had someone at our table nearly constantly. In the picture above, Brian, my youngest son, had not yet arrived. In the one below, his girlfriend was helping set up his display. There were approximately 500 visitors each day…it was a pretty encouraging weekend. Why not a Five String Fiddle? 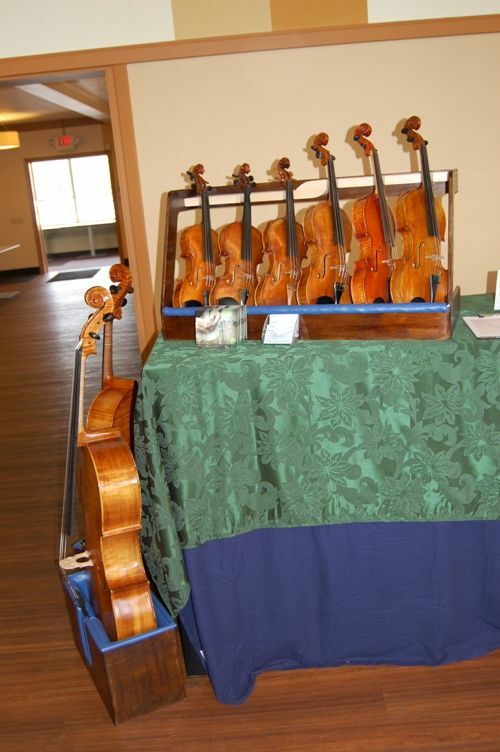 Violins have been codified in terms of form, size, materials and tuning for over 400 years. Orchestras have 30+ violins, between which the untrained observer would have a difficult time distinguishing, let alone identifying as having come from a particular maker’s hand. 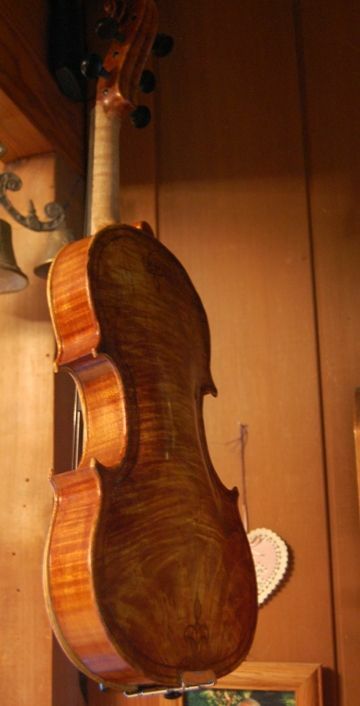 And yet experts can frequently tell at a glance when, where and by whom that violin was made. 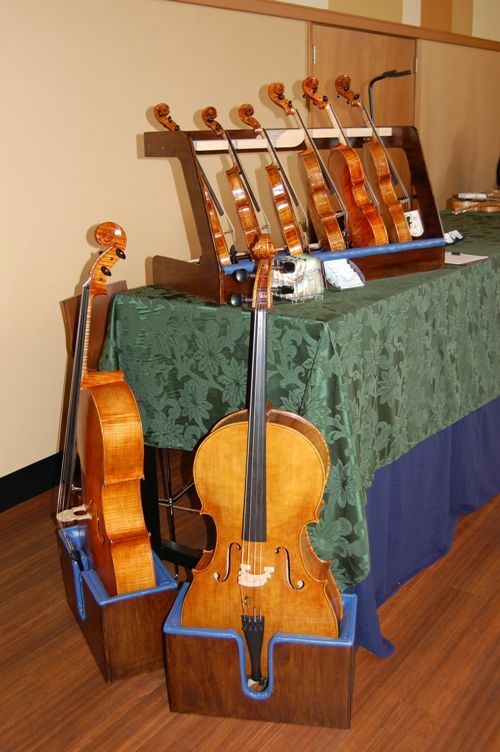 And ALL of them have four strings (count ‘em): G, D, A, and E. No five-string violins in the orchestra! The violas, too, have their four strings, always at C, G, D and A. They are less tightly defined, however and are all over the board in terms of size and shape. Some are so large that most normal-sized people can’t play them, and some are not much larger than a violin. But they all have those four strings, tuned exactly a perfect fifth below those of the violin. No five-string violas, either. 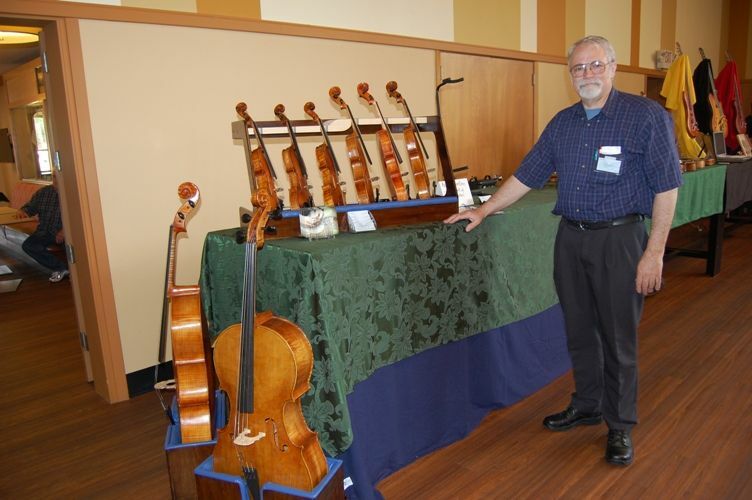 Really, a viola works best at what it does, and a violin works best at what it does, as specialized tools…but when they are so close in size—indeed, sometimes overlapping—what prevents us from having one instrument that covers the full range of both? A five-string fiddle? Well…that isn’t as easy as it sounds. The physical size of a violin is barely big enough to really produce the open G-string tone, so simply adding a low C-string will not work well…and the viola is almost too big to make good high-pitched notes, so adding a high E to a larger viola is usually not very satisfactory either. But it CAN work…with some tweaking. 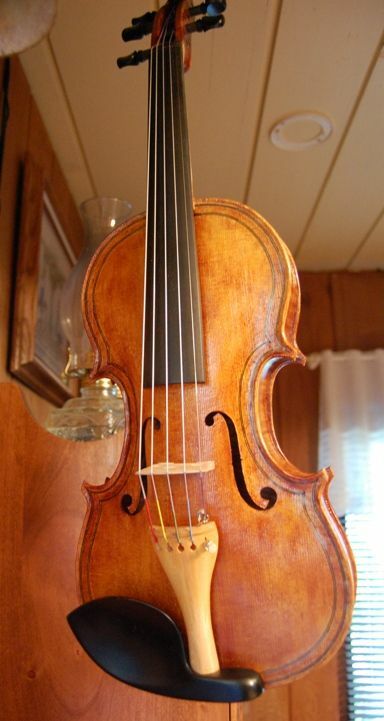 Honestly, probably a five-string fiddle would work best in the size of a small viola—say, 15”—or even 15.5”. 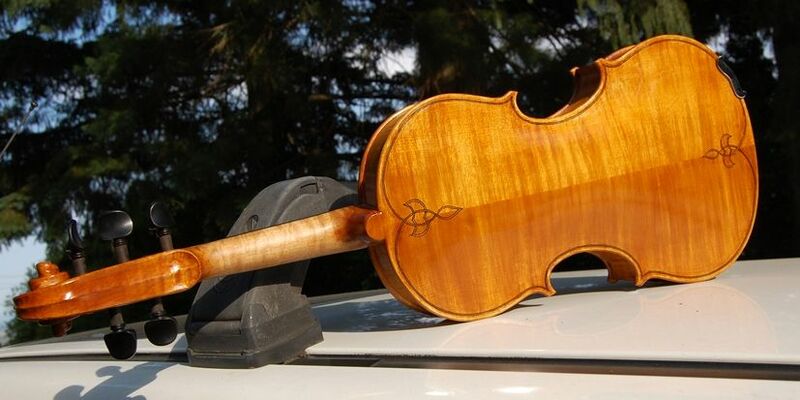 But country fiddlers and bluegrass fiddlers, who are waking up to the desire for a fifth string, and a lower range, don’t want a “five-string viola”–they want their instrument to fit in a regular fiddle case—not a viola case. They want a handmade five-string bluegrass fiddle. 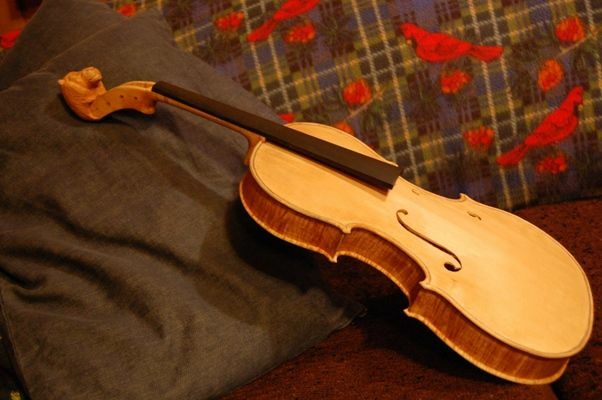 What has worked for me, so far, is to maintain the “footprint” of a regular violin, but increase the depth of the body a little; lengthen the pegbox, obviously, for the extra peg and string; thin the plates just a little more, and deepen the bassbar a bit. I may try widening the center bouts just a little, too, sometime. But for now, I have a working model, with which everyone seems very pleased: it is very easy to play, has good balance across all five strings, a big deep bass end on the C string, and clear, strong high notes on the E string. So, when a fiddler wants to be able to go low and growly, he/she can do so. When he/she needs a high end for some special sizzle, it is there. All in one fiddle case. 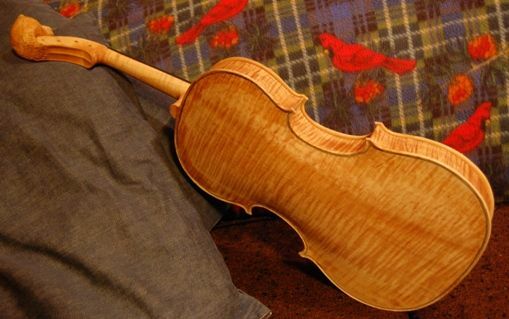 A five-string fiddle case. Front view of Oliver Five-string fiddle, by Chet Bishop. Sold. 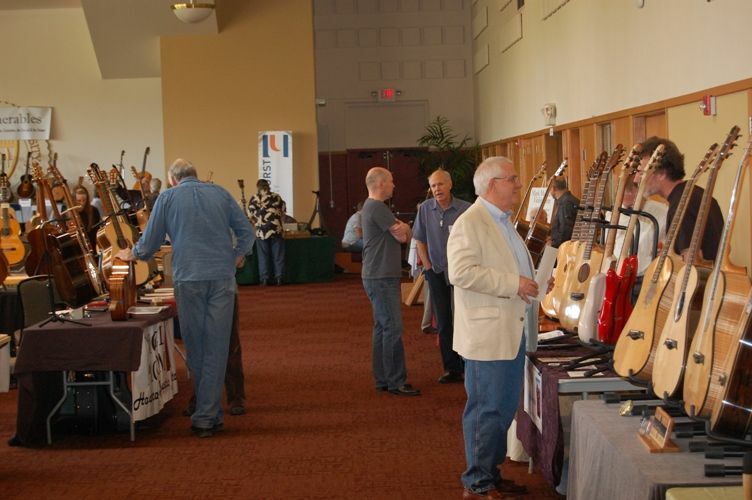 What is a “Luthier” (definition)? What is “Lutherie”? The old French word simply meant “a lute-maker”. And his business was called lutherie. The meaning has shifted, over the years, to cover the builders of all stringed instruments. 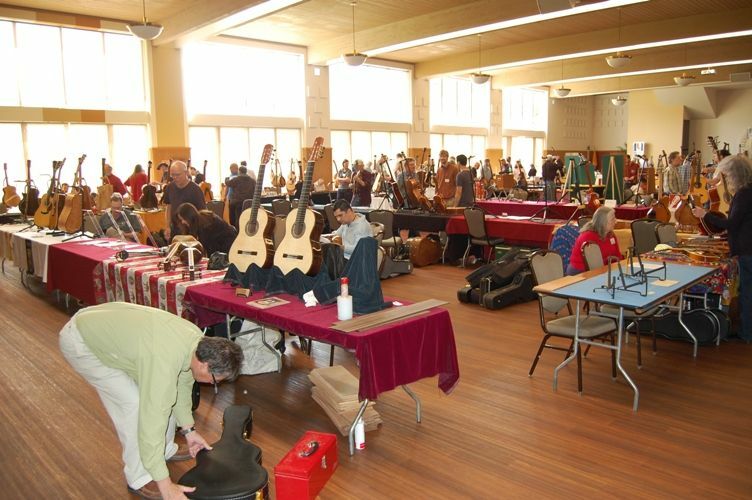 Lute-makers are still luthiers, but so are guitar-makers, ukulele-makers, mandolin makers, and, of course, violin-makers. 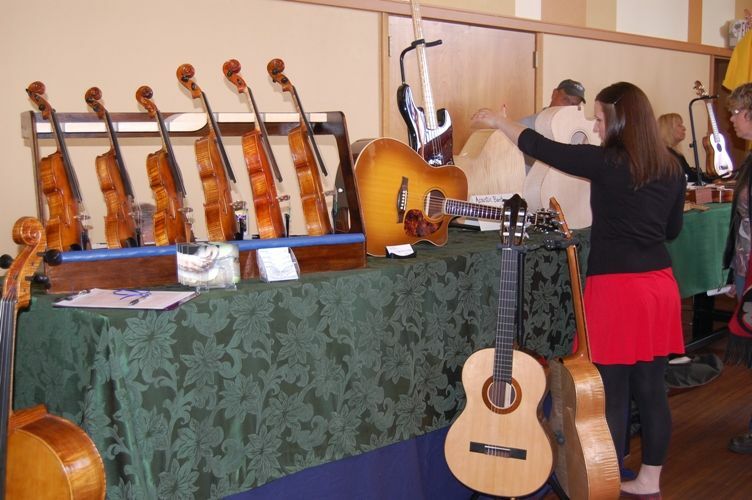 Violas, basses, cellos, five-string fiddles and dulcimers are also made by luthiers. Banjos, pianos, violas da gamba and harps, among others, are also built by luthiers. 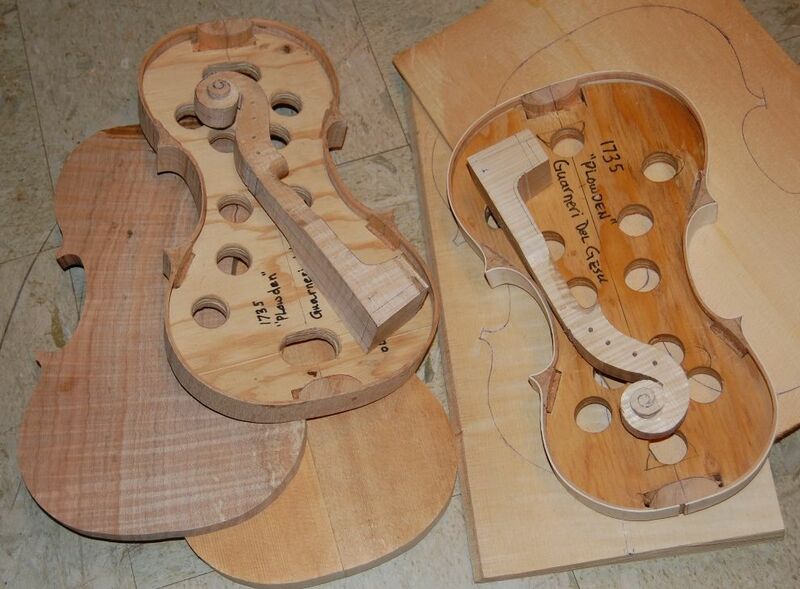 And the process of building and/or repairing stringed instruments is also called “lutherie”. 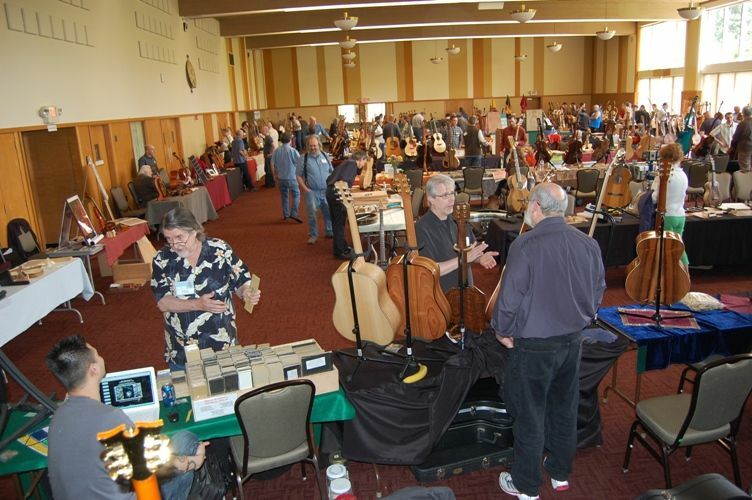 Usually when one is looking for a luthier, they are not looking for someone who made one guitar for a summer project, or something of that sort– they are looking for someone who is at least a competent worker, and who can reliably repair an instrument, without further damage. That takes some training and experience. Some people have the privilege of attending a full-time, extended training program, or serving a term as an apprentice, under a master maker. This last is still likely the best training, although some fine schools are now available. Some cannot take the time from their established responsibilities to go away to school for an extended period, and learn from books, and/or piecemeal from a variety of teachers. Galloup school: My son graduated from this school– I can recommend it. Roberto-Venn school: I have heard good things about this school too.